Last Friday, SchoolDude and FacilityDude employees got the opportunity to get their hands dirty while pitching in with Habitat for Humanity. 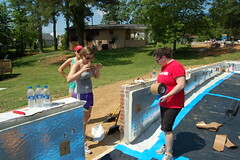 The group of 13 volunteered their time in a Raleigh neighborhood where 4 Habitat houses are currently being constructed. 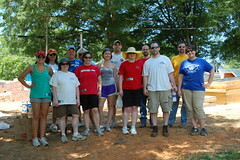 Habitat for Humanity was chosen by employees to be a recipient of The Good Dude initiative. The Good Dude program donates time and other company resources to local non-profits in need. Employees are given the opportunity to weigh in on the causes that they would like to support. Melissa Buchanan, Senior Client Advisor for the Client Service team reported back that the day was a great success!
" When we arrived, we received safety and job instructions from the site coordinator and quickly broke into teams to tackle the various jobs. 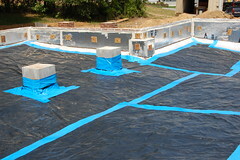 With the help of lots of water and sunscreen, we spent about 7 hours working on building basement crawl spaces, and we all felt a sense of pride in what we had accomplished at the end of the day. It was fantastic to see the empty brick and dirt spaces transform into protected spaces ready for the next part of the building process. As a team we were able to get out of the office and make an impact on the lives of 4 families by helping prepare their new homes." 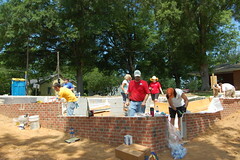 Habitat for Humanity of Wake County helps families own homes by providing a hand up. Families invest 250 hours of sweat equity into the construction of their homes and homes of others, provide a down payment of $1500 and enter an affordable 30-year mortgage. These families are living on a modest income and typically do not qualify for a traditional mortgage, and they are often living in overcrowded, substandard, unsafe, or subsidized housing. Habitat empowers families who have a stable income to become homeowners with monthly mortgage payments that are no more than 30% of their household income, typically around $600 a month including taxes and insurance. Habitat sets up these homeowners for success by also providing personal finance workshops and education on home ownership. Because of this, the foreclosure rate is extremely low as compared to that of homeowners with traditional mortgages.